Name : Pandiarajan R, age : 23 ( https://www.facebook.com/srpandiarajan ) , An engineering Graduate just as many in my country. Simply put, Following my passion, the hard way. 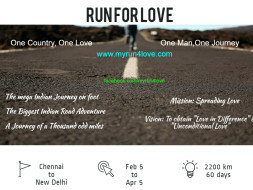 What is Run for Love? 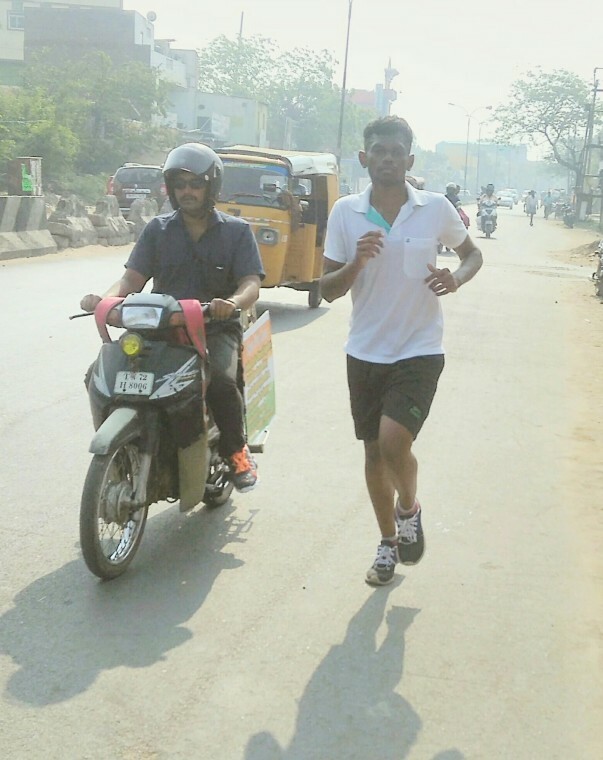 A one man marathon of 2200 km across 7 Indian States. 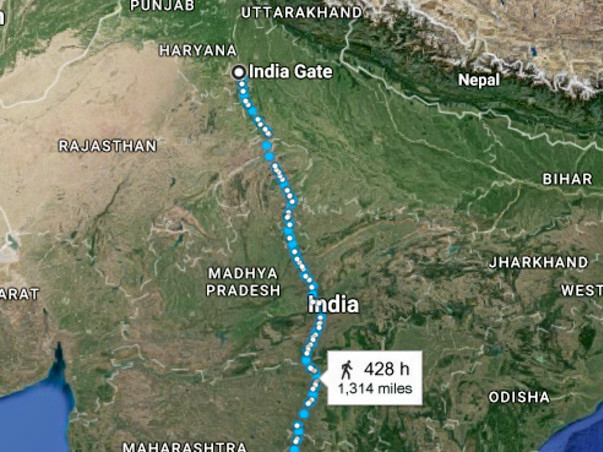 A journey of a thousand odd miles on foot. 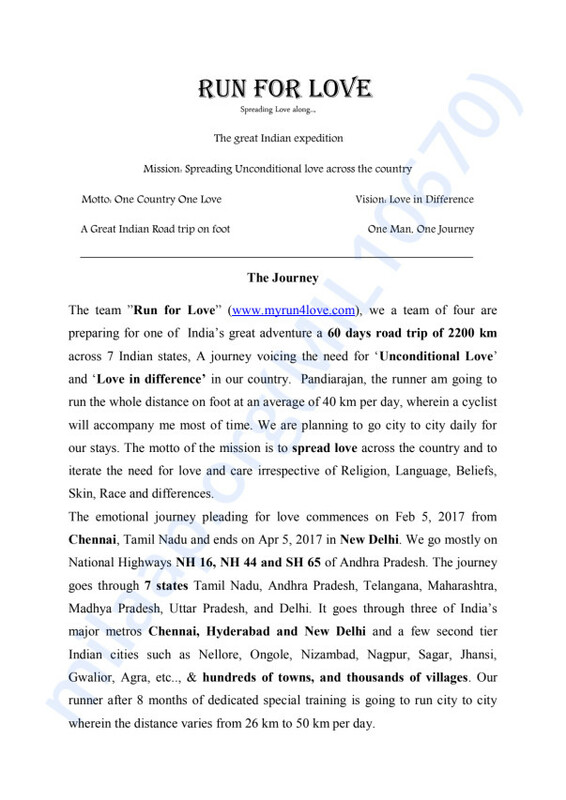 A mega Indian adventure pleading for Love, Care, unity and Compassion in the country. A cultural journey voicing the need to save every Indian traditions and culture. 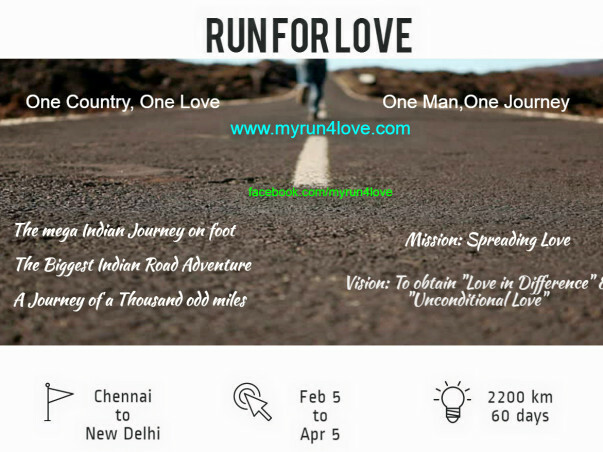 Run for love is the first of its kind ultra one man marathon from Chennai to New Delhi voicing the need for "Unconditional Love and Love in difference"in the country. A campaign across various regions of India to iterate the need for 'Unity in difference'. 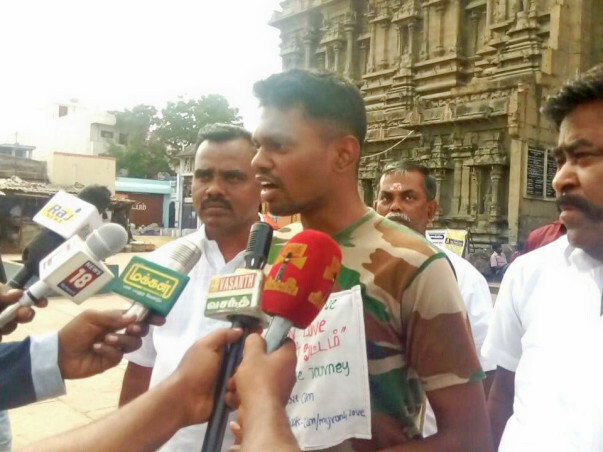 Educating Tamil culture to the world. Many people have asked me, will it change anything? Weather it happens or not, it's my duty to try. I have to say what I have to say, accepting is upto the individuals listening. You can't change anyone, you can only ask to change, that's what I do. "It's not what we do, but why we do it"
I run cause it's my passion. It enables me an opportunity to say out my points to the nation. I should probably say, I wasn't an athlete before this mission. A dedicated 10 months of training made me ready and I couldn't believe that I can run this long, now I am proud to say that I am an athlete more than that a ultra runner. Don't we have an exact plan? Yes we do, but plans never go the same way in reality. People asks us to stay safe, but we can't afford to. People say, Take good rest, whereas we can't sleep freely. People say wear good shoes, whereas I can't afford a proper road running shoe. Mosquitos are nasty, yet we can't afford mosquito tents. Yes, money is the biggest problem above all. And when I share this, People easily say, give it up and go home but I'm extremely sorry that I can't give up on my mission, on my passion, on my interests. Yes we struggle but we believe it would be worth it in the end. Living is easy, but living your dreams isn't. So here I ask you for your contribution, if you believe in our cause and if you believe we deserve your contribution. Let the whole 2200 km pronounce your name. When I started running I couldn't run 2kms a day, but now I run more than 40 km easily and most importantly I'm capable of reaching 10 km in 30-32 mins, which really is a good time. 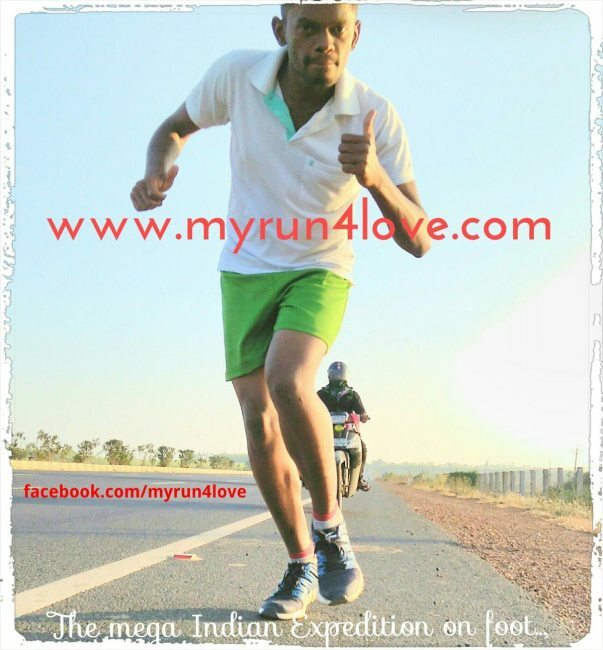 And I want not to waste it, I want to train myself specifically on 10 km runs (both off and on road) with the amount of effort I put and confidence I have if I can have some support I'm sure I'll one day compete in Olympics for my beautiful nation, I know it takes a lot and that's exactly I need your help. will the amount quoted be enough? No, it's not even 1% of what i'll need, but I don't want to ask much, whatever you can do it will really help shape our future. For my 10 months of practice and training, I had to took loan Nearing 3.4 lakh (5000$), leaving that, I'll need INR 12 lakhs (15000$) for one year of training, medical, Kits and supplements and another 2lakh (3500$)for coach and mentoring. The guys comes with needs decent cameras, recorders, Mike, Editors etc., that will cost around 3lakh (4500$). I know it's too much to ask for. That's why I put just 10000 (200 $) . 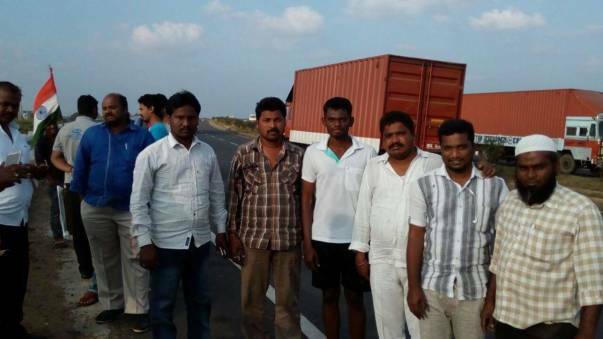 I request you to do whatever you can, Donating, sharing wishing if you believe in our cause. I don't know, but I'm shy to ask more, do whatever you can for us. My family wants me to go to a job, but I want to train for 10k. Then I thought politicians gets funded easily, why not me for my goal, that's why I started this fundraiser. *I'll only get 70% of the amount raised here. I need your help and support to achieve my goals. If you are an Non Indian support as a human for a human who's striving for success. One guy, who's along with me seems to have lost the interest entirely. Will we get what we deserve? We are getting a great amount of support from the public it feels nice .